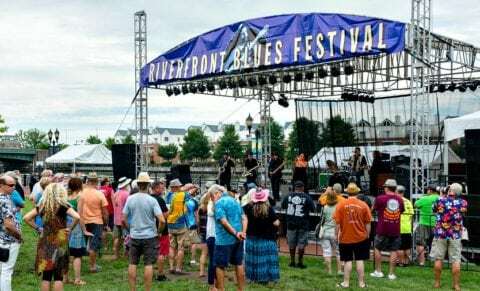 I love visiting Riverfront Wilmington in northern Delaware! 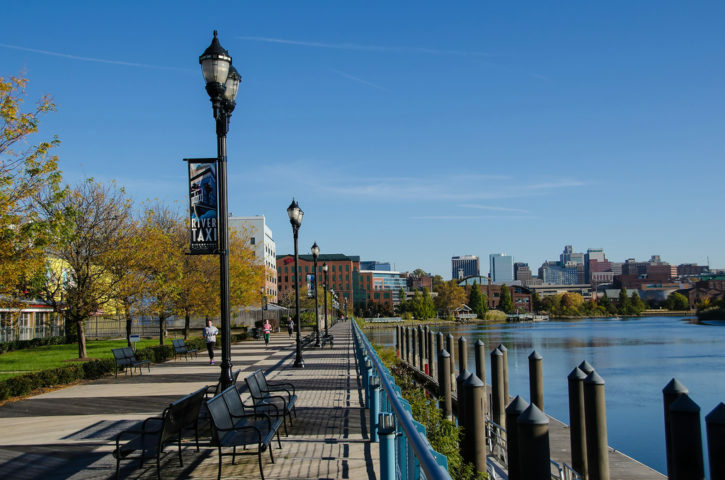 The Wilmington Delaware Riverfront is a dynamic live-work-play hub right along the Christina River downtown. My first treks to Riverfront Wilmington were back in 2009, when I temporarily relocated to the area and wanted to check out the local scene. I call Delaware my second home and return at least once a year. I always make a point to visit the Wilmington Riverfront for a walk, a meal, or just to relax. It seems like there’s something new to check out every time I return to the Riverfront. Here are a few of my favorite things to do in Wilmington Delaware — particularly along the Riverfront area! The Riverfront Market is always my first stop! The market unfolds inside a charming 2-story red-brick building that was built in 1900 during the busy industrial period along the river — but has since been refurbished to welcome foodies from all around. Those old, large timbers arching high above the exposed red-brick walls and checkerboard tile floor. The deli meat, cheese, and desert cases… they make me feel like a kid in a candy store! Oh, wait, there’s candy at Riverfront Market, too! And coffee… and tea… and sushi… and… well, you name it, and they’ve probably got it there! Plus, there are plenty of indoor dining opportunities to keep you cool during the hot summers and warm from the cold of winter. The Riverwalk is more than 1 mile long. It’s a peaceful place to run or stroll alongside the picturesque Christina River. I like using the scenic path as a place to get my exercise walks in. A brisk walk from the Riverfront Marketplace to Russell W. Peterson Urban Wildlife Refuge and back is one of my favorite ways to get going in the morning. And it’s fun to watch the kayakers, boaters, and river taxi roll past as I’m working out. I also enjoy reading the markers along the Riverwalk. These historical markers celebrate Wilmington Delaware’s colorful history — including the region’s founding as New Sweden in the 1600s and the city’s critical role in the Underground Railroad, which slaves used to escape from the South before their emancipation in 1863. 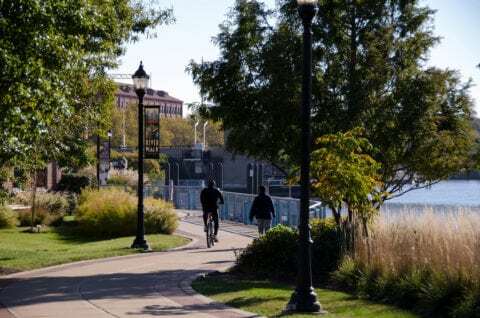 Walking along the serene Riverwalk, it’s hard to believe that before the Riverfront Alliance was formed in 1995 to redevelop the downtown Wilmington waterfront, this stretch of the Christina River was little more than a forgotten industrial wasteland. Public and private efforts to revitalize the Christina River have led to the creation of a 212-acre preserve in a freshwater tidal marsh now known as Russell W. Peterson Urban Wildlife Refuge. 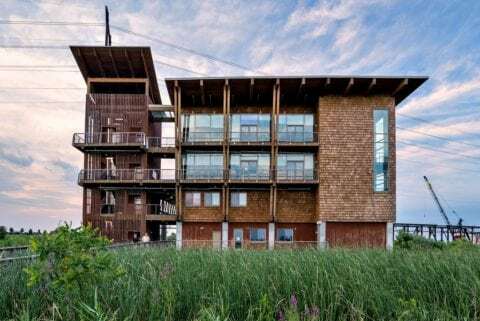 The DuPont Environmental Education Center serves as a visitor center for the wildlife refuge — tying together the Riverwalk, the river, and the preserve in a modern facility where you can learn about the plants and creatures that thrive in this urban sanctuary. 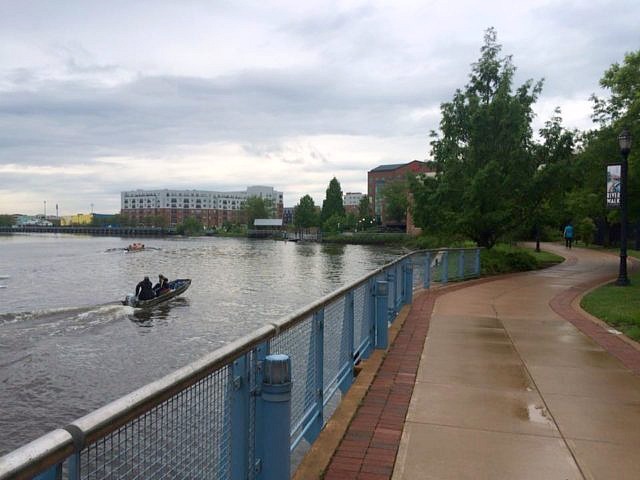 The Riverfront Wilmington River Taxi carries up to 29 riders to and from various points of interest along the Christina and Brandywine rivers. It’s a fun way to relax and enjoy the views for an hour! 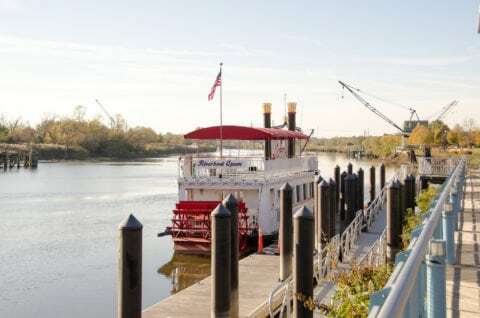 By the way, the Christina Riverboat Company also has several special tour packages (including a history tour of the Wilmington Riverfront), and you can also enjoy dinner while sailing on the river during a riverboat cruise. Thomas Garrett lived in the nearby Quaker Hill neighborhood where slaves escaping from the South found refuge along their trek on Underground Railroad. Harriet Tubman was also a slave abolitionist who helped coordinate a path to freedom for slaves by way of the Underground Railroad. The 2.4-acre Tubman-Garrett Riverfront Park is located right by Market Street Bridge . It’s one of my favorite relaxation stopping points by the Riverwalk! Oh, and it’s a great place to catch fireworks on the 4th of July! I haven’t hit these 2 newer spots along the Riverwalk yet, but I’d be totally remiss if I didn’t mention them for those who read this and have kids! The Delaware Children’s Museum is a place where science, math, and technology come alive in an enriching and safe environment. According to the Delaware Children’s Museum website, Delaware is one of a few places that didn’t have a children’s museum until recently — the facility is a state-of-the-art place with countless hands-on learning opportunities for kids. Something that I may check out someday if I ever have kids (or if I’m entertaining young nephews and nieces) is the 19-foot Earth Balloon — which teaches kids geology, map skills, and geography! Adjacent to the Delaware Children’s Museum is the Riverwalk Mini Golf center — with 18 holes of putt-putt action right next to the Riverwalk. They also offer milkshakes, Philadelphia water ice, jumbo pretzels, and soft serve ice cream here. Looks like I’ll be shouting “FORE!” at the Riverwalk Mini Golf course next time I’m in Delaware!